Northern bobwhites hold a special place in Georgia’s outdoor culture and wildlife heritage. In fact, Georgia has been known as a premiere quail-hunting destination for over 100 years and the Georgia General Assembly designated the bobwhite as the State Gamebird in 1970. Back in the quail boom years of the early 20th century, Georgia's landscape was a "sea" of usable habitat for quail due to extensive low intensity farming and forestry with little urban/suburban development. However, Georgia’s quail population has declined by more than 85% since the 1960s and consequently the number of quail hunters has declined by over 80%. This drastic decline is due primarily to the loss of quality early successional habitat (i.e. native grasses, legumes, weeds, briars, bugs and shrubs). Restoring this habitat type across Georgia’s landscape benefits quail, numerous songbirds, rabbits, wild turkey, deer and many other wildlife species, improves water quality, reduces soil erosion, and can enhance local economies by stimulating quail hunting and wildlife viewing. In response to the quail decline, Georgia’s Board of Natural Resources worked with key members of the General Assembly and other supporters to develop and fund the Bobwhite Quail Initiative (BQI) in 1999. The BQI is a proactive effort directed at restoring quality habitat for bobwhites and other early successional wildlife species on working farms and forestlands. The initial phase of BQI focused efforts in 15-upper coastal plain counties where interested landowners were provided with detailed technical assistance on restoring and managing quail habitat, and on a competitive basis, economic incentives to implement certain habitat management practices (e.g. field borders, hedgerows, thinning and burning pine stands, and fallow corners) to enhance row crop fields and pine stands for bobwhites and other early successional wildlife. 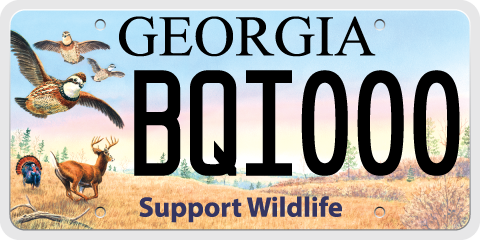 The “Support Wildlife” vehicle tag and matching grants finance the BQI program but due to declining revenues the landowner incentives segment of BQI was suspended in 2011. In 2016 the BQI program was able to begin offering landowner incentives in cooperation with USDA’s Natural Resource Conservation Service (NRCS) through the Bobwhite Quail Southern Pine Savanna Restoration Pilot Project. The good news is there is continued interest and increasing efforts at focused habitat restoration to benefit bobwhites and numerous other wildlife species that depend on early succession. Based on 11-years of BQI implementation and a recent revision of the National Bobwhite Conservation Initiative (NBCI), we are in the process of expanding our bobwhite restoration efforts to all or parts of 68-Upper Coastal Plain counties. These counties were selected for focused quail restoration efforts through a collaborative landscape analysis workshop. This process was conducted by Tall Timbers Research Station and Georgia WRD as part of the NBCI revision and identifies farm and forest landscapes with the greatest bobwhite restoration potential. 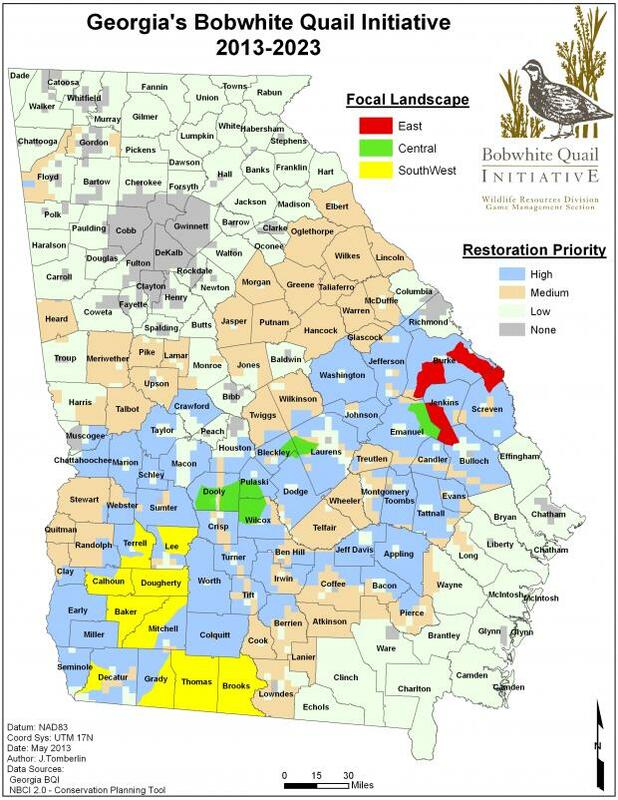 Currently, the Georgia NBCI stepdown plan is being developed and will transition the BQI program into these priority restoration landscapes within the framework of NBCI. Our plan is to work intensively with interested landowners within these priority areas, form landowner cooperatives where feasible, and work with managers of select public lands to restore and manage bobwhite populations. Future restoration success of bobwhites is dependent on securing adequate state and federal funding for landowner incentives and technical assistance, collaborating with other state, federal and NGO conservation partners, and targeting conservation programs and available resources within these prioritized county and subcounty landscapes. Call a professional wildlife biologist at 229-420-1212 or 478-994-7583.